A trip to the Seattle area would not be complete without spending a day or two hiking on Mount Rainier. The National Park is within driving distance of Seattle and the mountain can be seen from many points inside the city, especially from the Space Needle on a clear day. 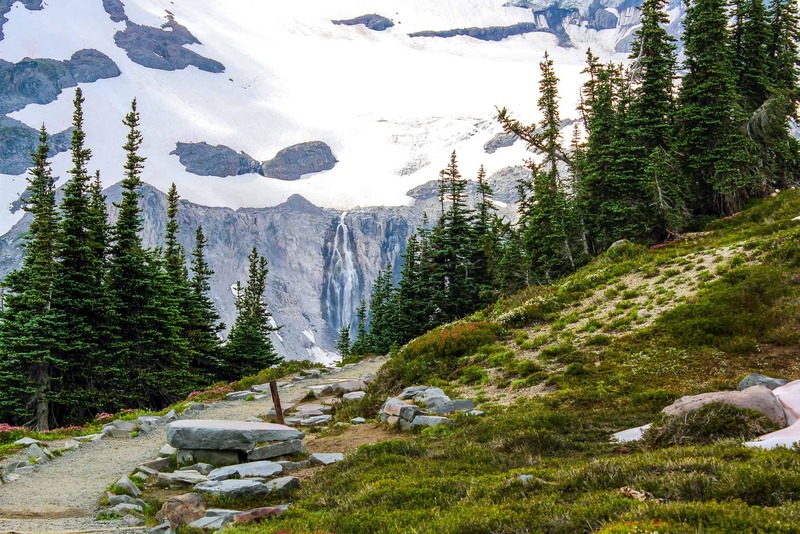 If you love hiking or being in the outdoors, visiting Mount Rainier should be on your list of things to see! If you plan on visiting Mount Rainier, check out the Tourism Website for the mountain. For more information on the National Park, here is the official website. For driving directions, click here. The website has a lot of information to help you plan what you need to bring, how to reach the park, what area of the park you should visit, and more. I highly recommend doing some research before you arrive! We visited the Southwest Region of the park. If you enter this way, don’t be alarmed if you feel like you’ve been driving forever when you first enter the park. Its quite a drive once until you reach where you can actually park your car. Then its a short trek to the visitor’s center before you actually start the hike. Factor this in when you plan what time you want to start your day. We left Seattle around sunrise to reach the mountain in time. You do not want to get stuck hiking back down in the dark, especially if you don’t have a headlamp. Mount Rainier National Park covers 369-sq.-miles of land. There are plenty of options for exploring this beautiful park. The park consists of 5 Regions: Carbon River, Longmire, Ohanapecosh, Sunrise, and Paradise. The Mountain itself is 14,410 ft in elevation. That means there’s a lot to see! Chose wisely. We only spent time in one of the 5 regions: Paradise. To learn more about Paradise, click here. The hike in Paradise that we trekked consists of paved roads, man-made steps, and naturally paved paths. For those reasons it’s not too difficult of a hike. But depending on how far you hike, the paths get more difficult and you still have to be weary of elevation change. Know yourself and what you are capable of before choosing a region and hike to visit. The weather we experience in early August was perfect. The sun was shining, flowers were in bloom, and some snow was forming on the mountain tops. As we rose in elevation the temperature dropped, but we never needed more than a light outer layer and pants. Check the weather before you go to make sure you pack appropriately. Remember, if the conditions are not safe for hiking, turn around or do not attempt a hike. The trail we took is known as Skyline Trail / Panorama Point. You’ll pass through forests, fields of wildflowers and rubble, as well as glaciers on this hike. The wide-variety of terrain is why this trail is highly recommended. We chose this trail because my husband summited Mt. Rainier in March 2013 and this was part of the trail he took to reach the summit. Once you reach the base of the Nisqually Glacier, you can see people on their way to the base camp (or who are at base camp and acclimating before their next-day climb to the summit). Once you reach the glacier, pictured above, the trail becomes more difficult. It’s a good idea to stop here to catch your breath, eat some food, and acclimate before continuing ahead. It’s also a great spot for a rest because the view is breathtaking. It’s hard to tell just how massive the glacier is from the photo. Above are examples of the trail to the Panorama Point. At Panorama Point you’ll feel like you’re in the clouds. The views of the distant mountains are amazing. You may forget to look down. There were several squirrels and chipmunks scurrying about here, and along the trail. My favorite animal we spotted was the marmot! You may feel exhausted by the time you reach your car at the end of the day, and possibly sore the next morning, but it’s worth it! On our way out of the park, we took a slight detour to eat dinner at Copper Creek Inn & Restaurant outside of Ashford. Its was a great spot to stop for a lot of food after hiking all day. Have you visited Mount Rainier National Park? Share your experiences in the comments! For another day trip idea, check out my post on visiting Victoria, B.C. from Seattle!